An outstanding achievement by Borderline members (indicated in bold), led by Linda Nye who won the council’s $1500 acquisition with ‘Spiritual Song of the Aborigine’. 3. Original poem by Alan Rose. 4. Interesting example of portraiture – Linda Clutterbuck – ‘Fay’. 5. Interesting interpretation of a subject – Louise Jenkins – ‘Quest for the Warwick Gold Cup’. 6. Interesting use of a medium (watercolour) – Emily Coelli – ‘Orphan Child’. 7. Interesting 3D exhibit – Janet White – ‘Quantum Sheep’. The Regional Painting Prize was awarded to Louise Jenkins for ‘Kilmarnock Car Yard’. 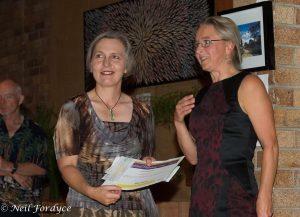 The Minor open Prize was awarded to Janet White‘s exhibit ‘Fifty Throws of Clay’. The Major open prize was awarded to Nola Sindel for ‘Shady Lady’. Tenterfield Shire’s Acquisition Award for 2014. 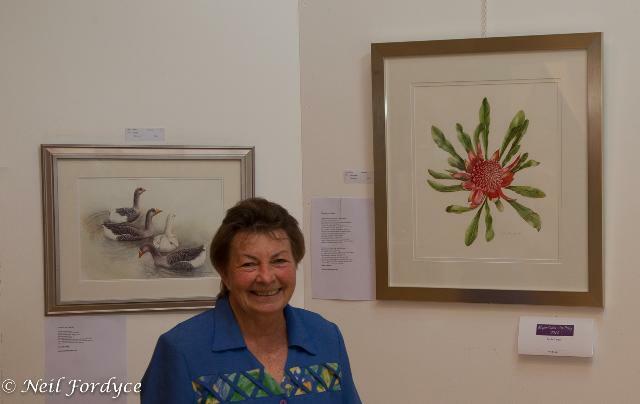 Congratulations Linda Nye for your painting ‘Spiritual Song of the Aborigine’. 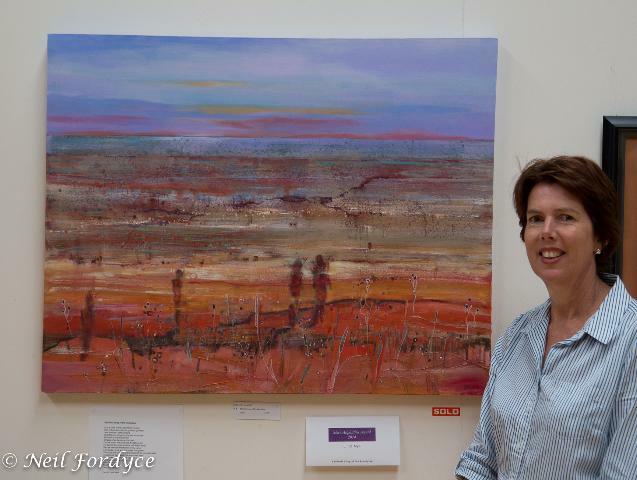 “Eye-catching contemporary interpretation of the Australian landscape; eloquent use of colour, symbolism and linear elements. An experienced technique with the medium producing textural complexity within its overall mastery of simplicity and under-statement”. The Hangers’ Prize, sponsored by Borderline, went to young artist Sahara Bulich – ‘Magic in the Night’.